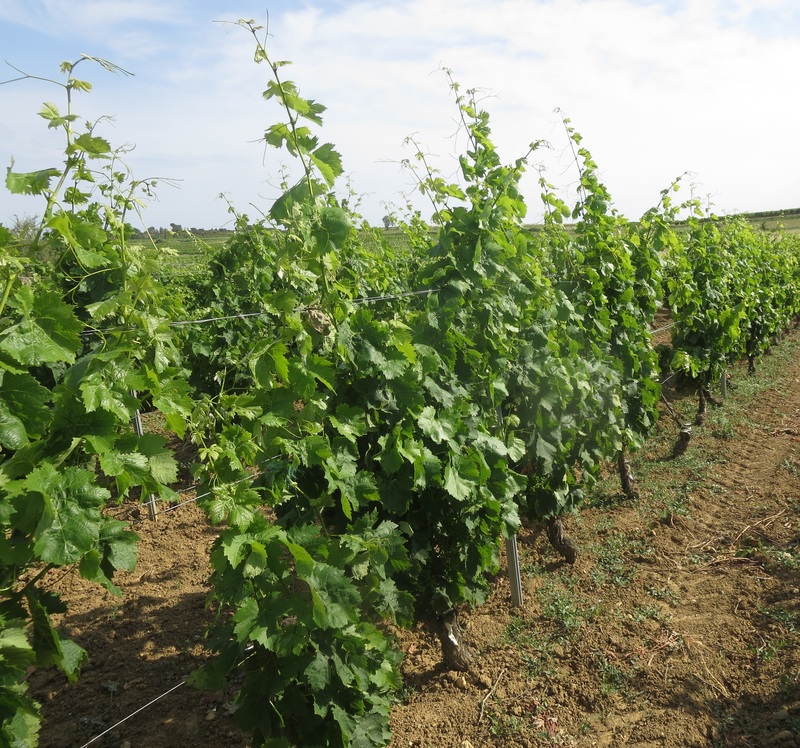 The mild weather over winter was followed in the Languedoc by a slow start to summer heat. The resulting warm, humid weather brought disease as it did in many regions of France. Mildew, oidium and couloure are all vine diseases which occur regularly and 2016 was no different but with a bigger hit than usual. Sadly, humid days in the mid 20s and cool nights are exactly the conditions favoured by downy mildew, and it prospered. The humidity in the soils created ever more favourable conditions for mildew. 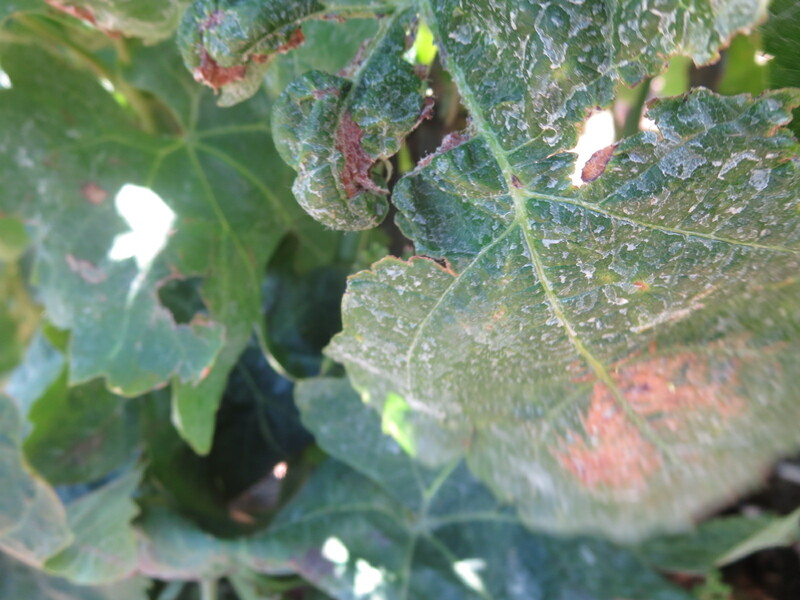 Downy mildew lives as spores in the soils and any rain splashes them onto the vines. Mildiou is not a fungus as commonly believed, it is a one celled spore which germinates in warm, humid conditions especially between 16 and 24 Centigrade – exactly the conditions we saw in April and May of this year. Jeff Coutelou spent many nights out on his tractor spraying the vines to try to protect them. 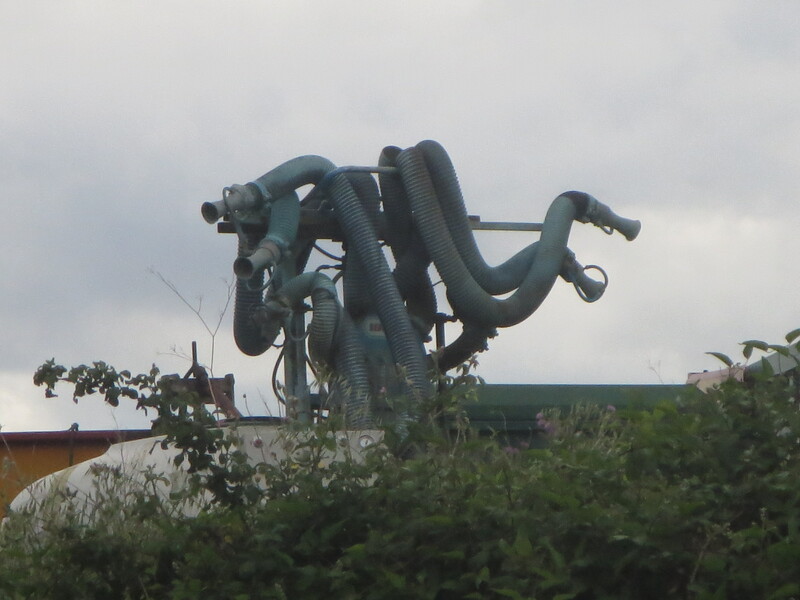 As an organic producer (and much more) he cannot (and does not want to) use manufactured, chemical sprays. Instead he used sprays based on rainwater with seaweed, nettles, horsetail and essential oils of sweet orange and rosemary. These are better absorbed by the vines in the cool of the night. 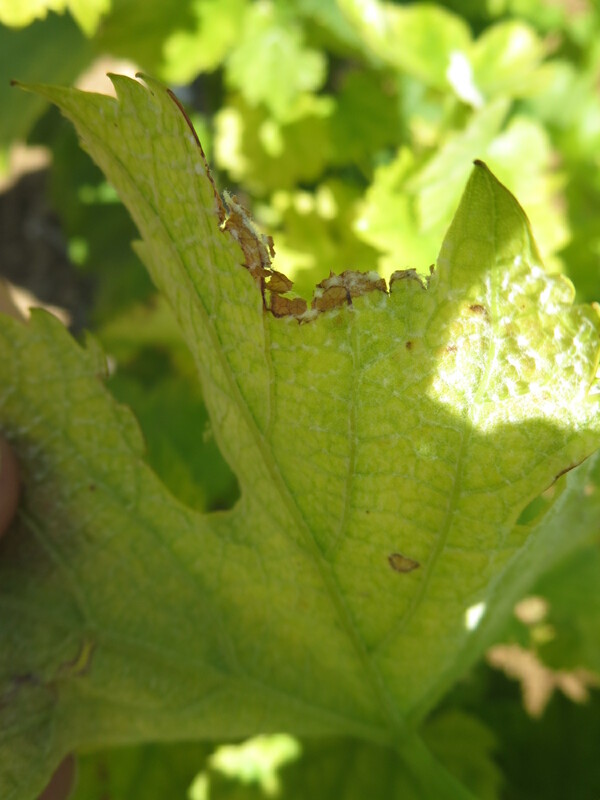 Mildew appears as small yellow / green spots on the upper surface of the leaf which gradually turn brown and spread to leave an unsightly vine. Underneath downy white /grey spots appear, the mildew is well established by this point. It affects the grape bunches and leaves them dried out and shrivelled. 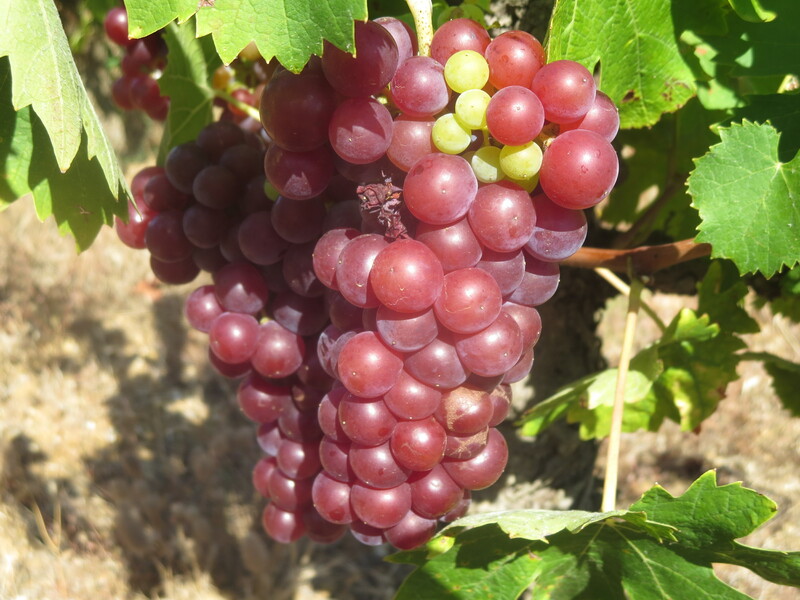 By the time harvest arrives the bunches contain a mix of healthy and diseased grapes. Severe triage is required. Bunches such as the one in the photo above will be discarded immediately. Where there are health sections though the bunches will arrive at the triage table and be sorted rigorously. Jeff reckoned that in some vineyards, especially the white vines of Peilhan, losses were up to 60% from mildew. Seriously damaging. 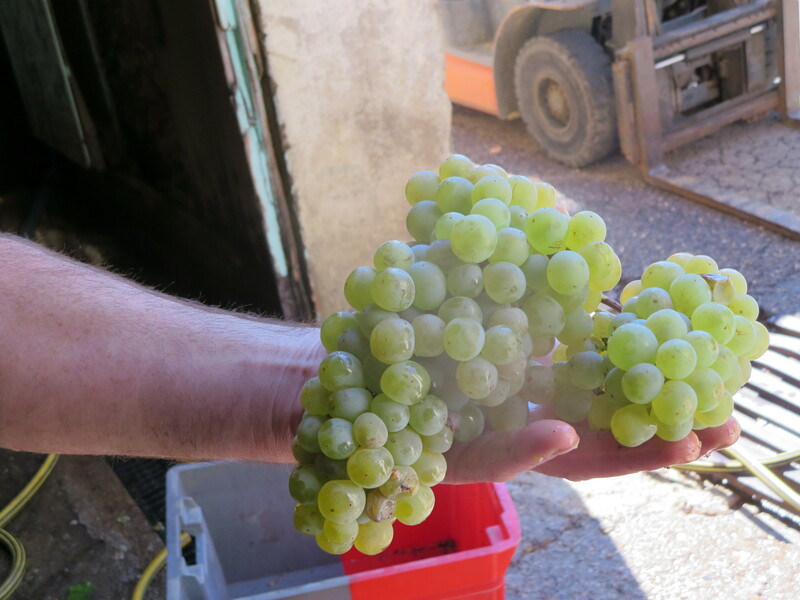 Here is a clear demonstration of the advantage of hand harvest (vendange manuelle), machines would simply swallow the lot and in less thorough domaines or caves the bunches will all go into the wine. Oidium is a related problem to mildew but slightly different. It too thrives in warm days and cold nights (so springtime is its peak period) , it too loves humidity. So, spring 2016 was ideal though oidium was less rampant than mildew. Unlike mildew it is a fungal based spore. Conventional treatments would be chemical and even organic producers will use sulphur, a naturally occurring element. Organic producers are limited to the amounts they can use as sulphur does damage the fauna of the soils. Jeff Coutelou uses less than a quarter of the permitted amounts because he sees it as a last resort. Instead he prefers treatments based on horsetail weed, nettles and other beneficial plants made into a tisane which can be sprayed. It may not be as all-destroying as synthetic chemicals but Jeff prefers the soils to be healthy in the long term by using these natural plant based treatments. These photos show grape bunches hit by oidium in 2016, the powdery residue is clear though the bunches are less damaged than mildew affected ones. Nevertheless oidium is destructive and spoils wine so, again, careful work in the vineyard and cellar is needed to keep oidium out of the grape juice. Like most fruit plants vines grow flowers which then develop into the fruit. Vine flowers are very beautiful but also very delicate and don’t live long on the plants, a matter of a few days. 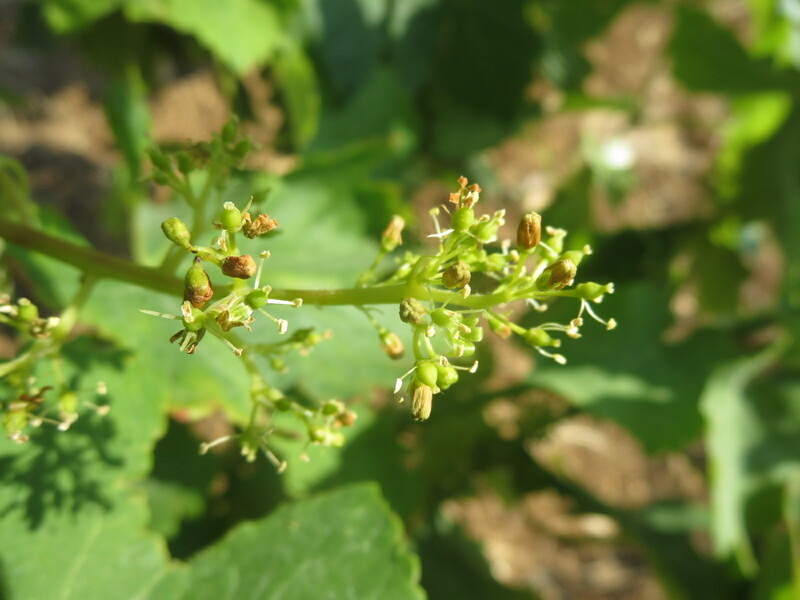 If heavy rain and wind hits the vines at this stage of their development then the flowers can be easily damaged or broken off the plant. The result is that fruit cannot develop where there is no flower, coulure. Where flowers are damaged then berries might grow very small and seedless, this is called millerandage. 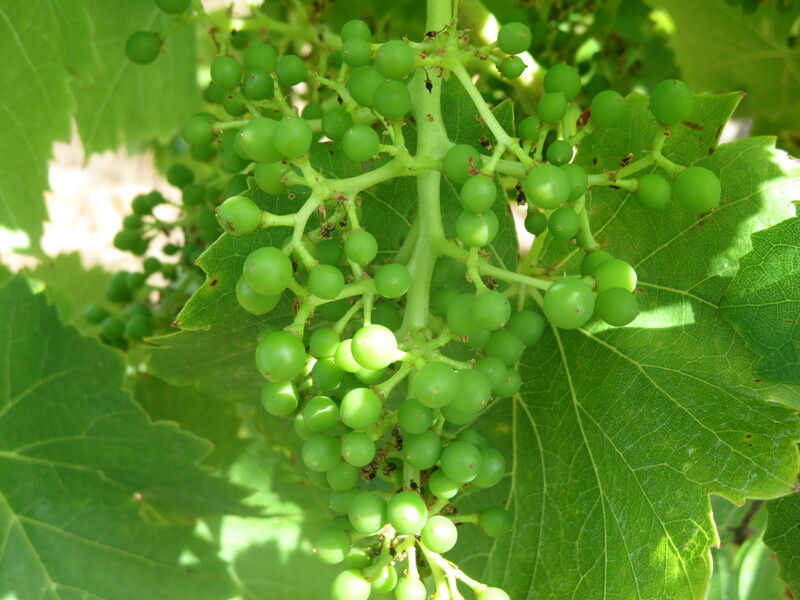 Similarly berries might ripen unevenly within a bunch, green berries alongside healthy, ripe grapes. There is nothing that the vigneron can do of course, the damage is done by the weather and no producer can successfully combat weather. Nature wins in the end. So, once again, the vendangeur and those sorting in the cellar are crucial in ensuring that only healthy fruit goes into the wine. I cannot emphasise enough the importance of all stages of wine growing and production. From their budding through to vendanges the vines must be tended, and in the cellar observation, determination and care are needed too. 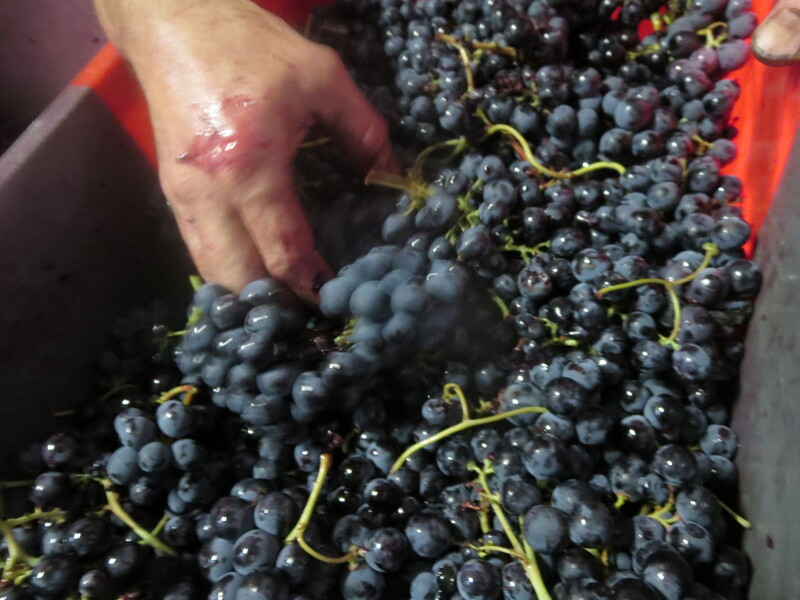 To make good wine requires hard work, healthy grapes and love as Jeff has said many times. And have a look at one of those last photos again. In the top right corner you will see another of 2016’s natural problems, one subject of the final part of this series. 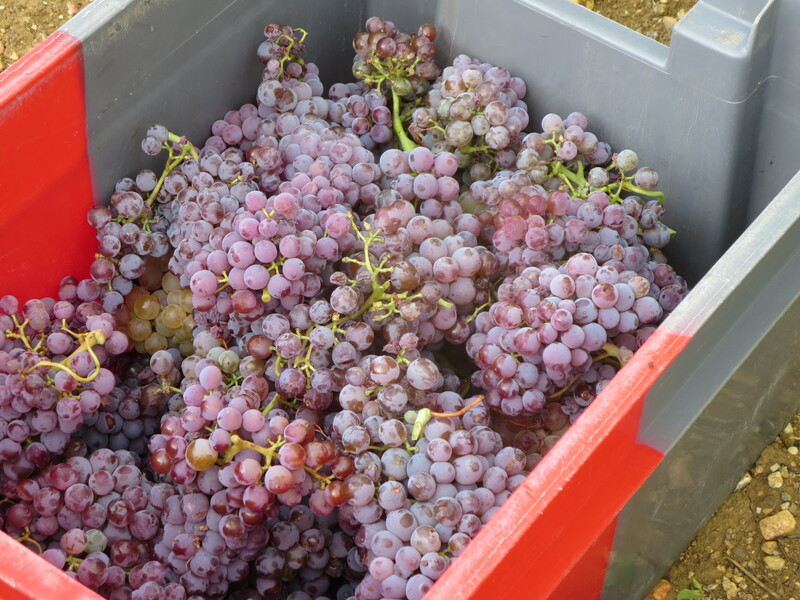 Categories: Vignerons, Vines | Tags: bio, coulure, downy mildew, Jeff, Mas Coutelou, mildew, mildiou, millerandage, oidium, organic wine, powdery mildew, sorting table, tri, triage, Vine disease | Permalink. As work on the cellar ratchets up a notch in the next few weeks it was time to bottle the last of the 2015 wines which will be made for the moment. The framework for the new mezzanine floor is in place and actually looks quite beautiful. It will be reinforced with concrete however, and the metal cross bars will disappear (which might stop us knocking our heads). Plumbing has also been tidied up and improved. Cuves will be placed below and on top of the structure. More work on stairs, flooring and around the cellar will happen soon. As I am heading back to the UK for a couple of weeks or so, it will be exciting to see the changes upon my return. The vines continue their growth in the sunshine and heat. Mildew problems are largely contained though some humidity leads to sporadic outbreaks (apologies for the pun). Sadly, there is a new threat of oïdium (powdery mildew) which likes that humidity and the warm days with cool nights we have been having. 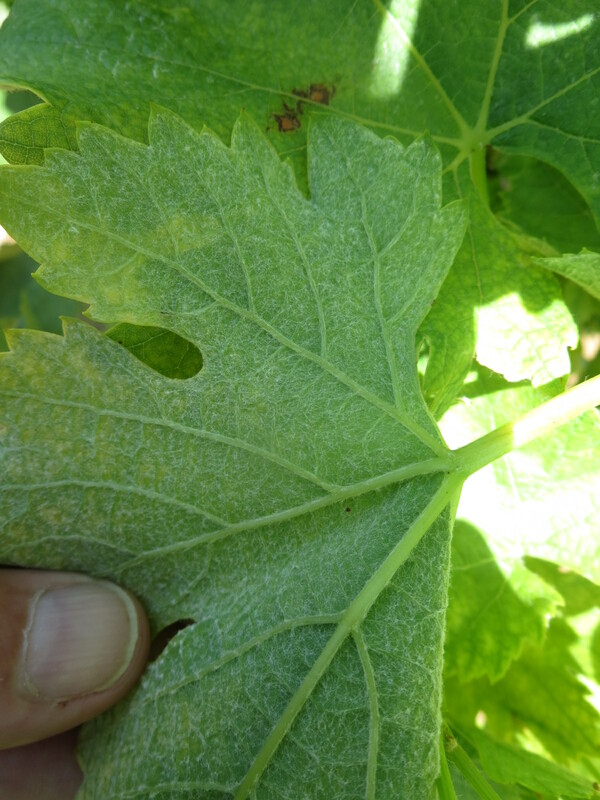 Powdery mildew shows as grey, white spots on the leaves and the grappe. 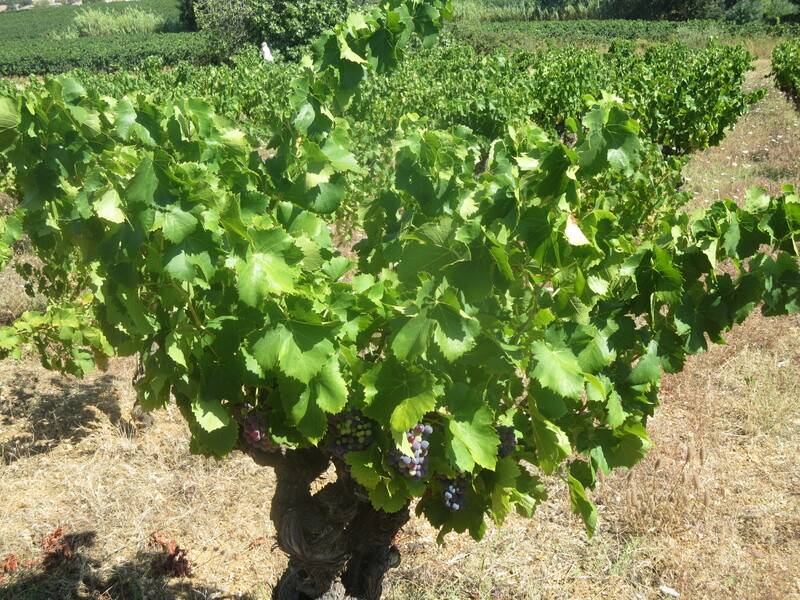 Certain cépages are more vulnerable, including some of the traditional Languedoc varieties such as Carignan. The treatment is to spray sulphur powder and Jeff Coutelou made the first treatment this week in an effort to contain the problem, a job completed on Saturday morning. 2016 certainly has been a struggle. Meanwhile 2015 wines such as Flower Power and L’Oublié went into bottle on Wednesday June 29th. You might recall that the L’Oublié assemblage was made a few weeks ago and after spending time in tank, marrying together, it is now in bottle. Both of these wines are extremely good, well worth waiting for when they are finally released which won’t be for a while. Jeff also put together a new cuvée exclusively for the French market, it will come in litre sized, Bordeaux style bottles as a «vin de table». An assemblage of various cépages it will be cheap, very drinkable and very desirable. The size of the bottles meant that they had to be filled by hand rather than the machine so Thursday was fully occupied with this cuvée. Jeff refers to it as a vin de gauche, after wine writer Vincent Pousson referred to Jeff as one of the last vignerons de gauche (left wing winemakers) because of his low prices making his wines accessible to all. It will be a wine to share and it will disappear down that litre bottle very quickly. 2015 seems increasingly like a golden year, its wines are certainly glittering. 2016, well despite all it has thrown at us, there is hope. 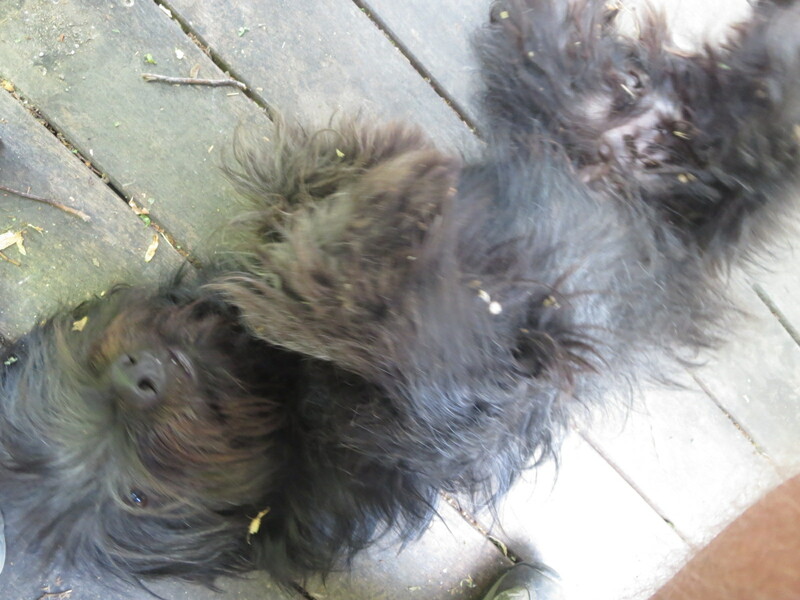 Meanwhile the summer wine is bottled and the heat is getting to some of us, even after his haircut. Categories: Vignerons, Vines, Wines | Tags: Carignan, Flower Power, L'Oublié, mildew, mildiou, oidium, vin de table | Permalink. April 27th saw a number of visitors to Font D’Oulette (Chemin De Pailhès), home of Flower Power where we grafted vines recently. France 3 television were here to record some footage for a report on biodiversity, so who better than Jeff to describe and demonstrate how he has worked to bring life to the vineyards around Puimisson. Rather less welcome was the invasion of snails, I spent all morning removing thousands of them from the vines. They clearly enjoy the organic greenery and, in particular, the young buds. It was noticeable that where the vine had grown more fully the snails were few in number, instead they were grouped on the slower growing vines where the buds were small and fresh. Bullies. As the days warm up the risk of diseases such as oïdium and mildew increases. 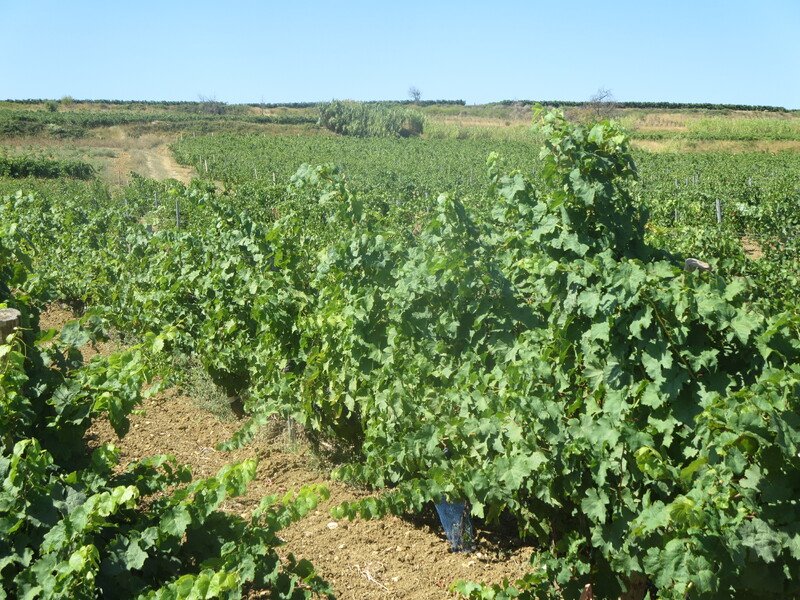 Therefore, it was time to spray the vines to help them resist these damaging diseases. However, being organic, there is no question of synthetic chemicals. This was a spray of nettles, comfrey, ferns and seaweed mixed with rain water; organic, natural products. Julien sprayed on foot and then Jeff and he rode on the tractor to spray two rows at once in Rec D’Oulette, home of Flambadou. Oy watch where you’re spraying! Across the vineyards the vines are maturing rapidly. 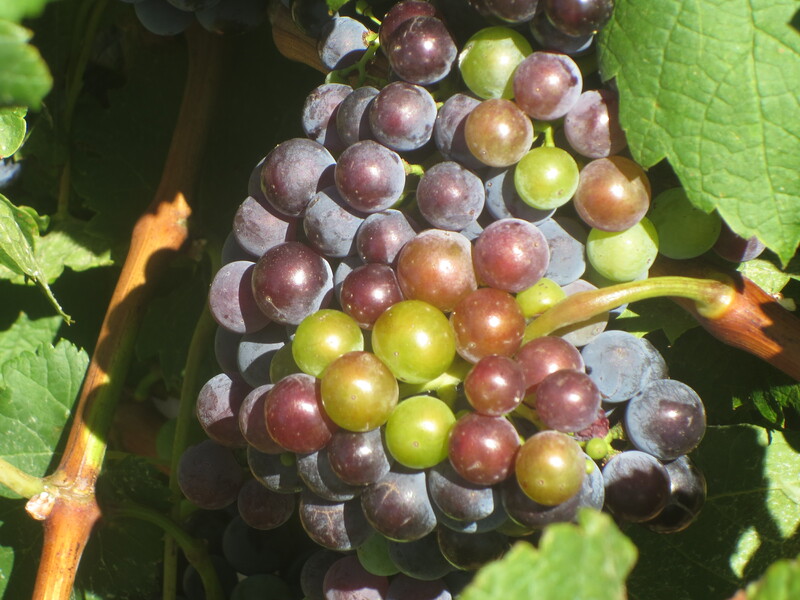 The buds are separating showing the future grapes and bunches. Tendrils are pushing skywards, remember that vines are climbing plants. The leaves are now of good size, soaking up the sunlight to help photosynthesis and provide energy to encourage the growth of the vine. The sunshine and drying winds may not be perfect but the vineyards of Mas Coutelou remain small havens of flora and fauna. Categories: Vignerons, Vines | Tags: biodiversity, comfrey, ferns, Font D' Oulette, frost, Loire, mildew, nettles, oidium, Rec D'Oulette, snails, spray | Permalink. 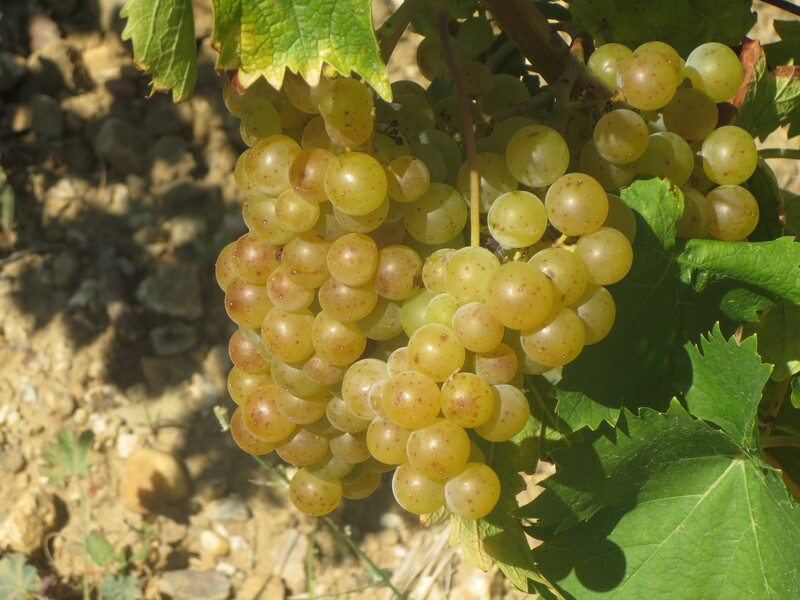 It was June 12th when rain last fell on Margon and the vines in the region, although generally doing well, were starting to show signs of fatigue and heat stress; leaves curled in upon themselves, some yellowing, a slight shrivelling. A few drops fell on July 25th but the skies had been very dark and had promised much more, it was almost cruel to have that rain, a tease of what might have been. However, July 31st brought around 10mm to Puimisson. 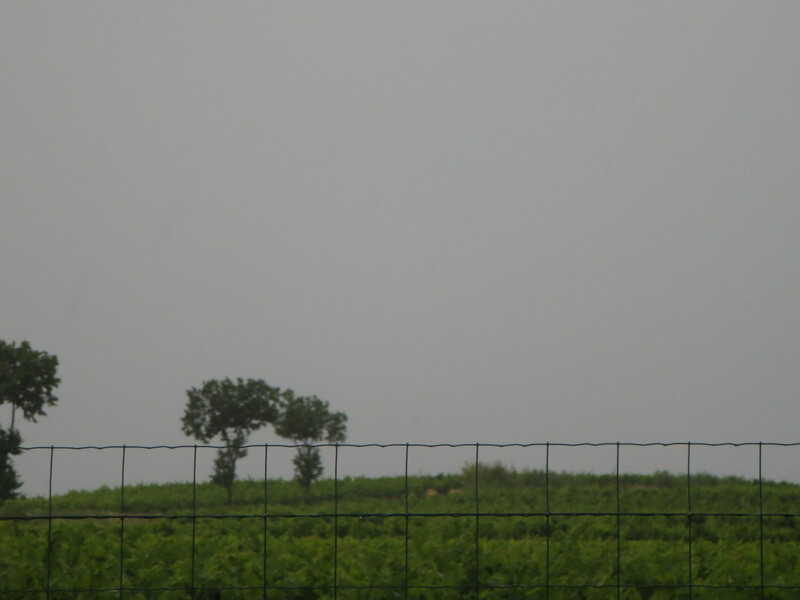 A decent rainfall, enough to give the vines a drink and to stop the drying out process. Not enough of course after weeks of lack of moisture and some more rain in the next few weeks would be very much welcome to swell the grapes and the harvest. 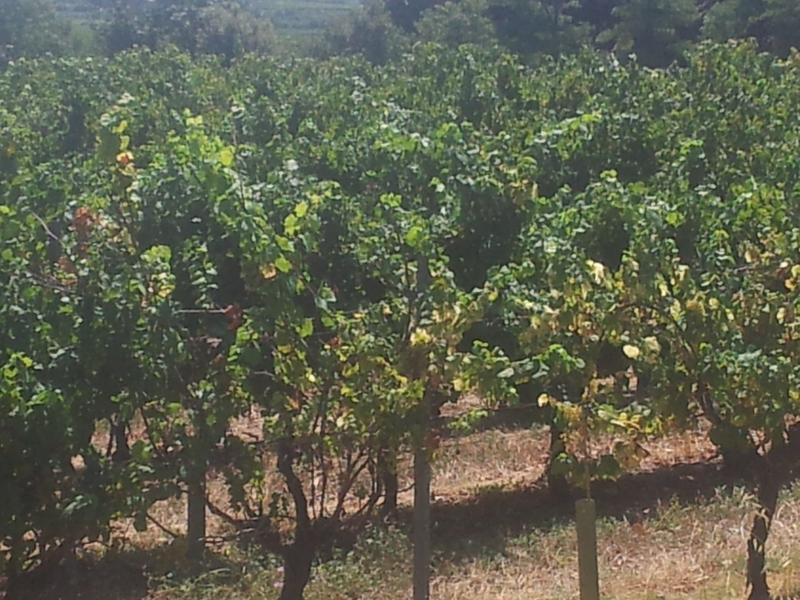 The vines are now pouring their energy into their fruit rather than their vegetation, but they need the nutrients to do so. So, how had the vines responded to the rain which fell? 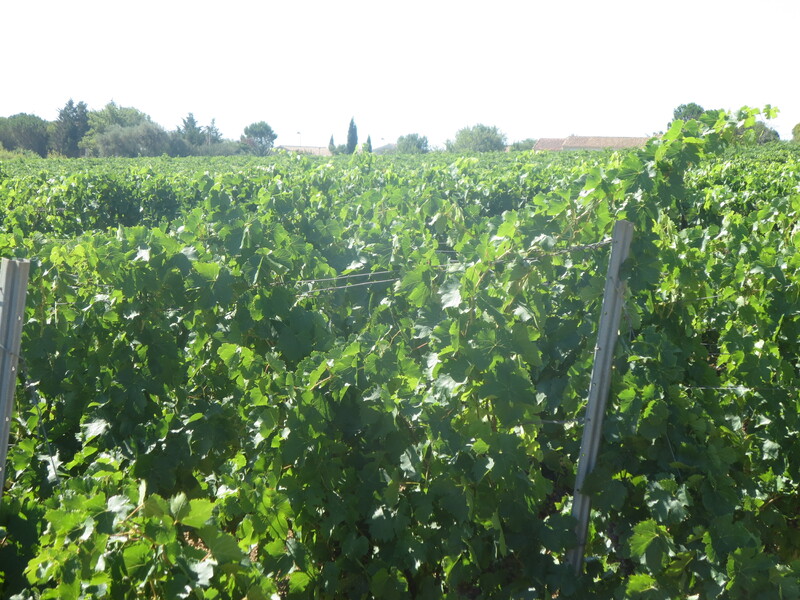 Well a tour on Sunday (August 2nd) showed the vineyards of Mas Coutelou to be in rude health, a decent harvest is now predicted though that extra rain would be most welcome. 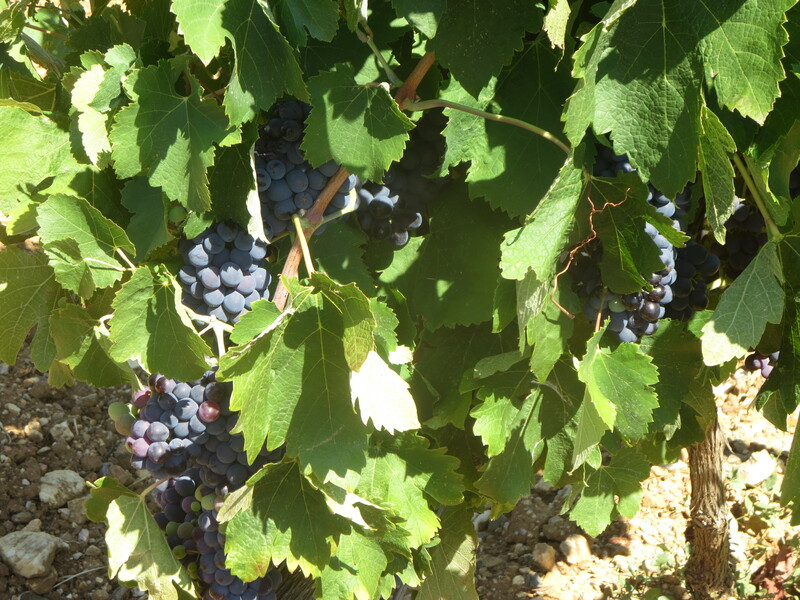 Segrairals, biggest of the vineyards, showed some healthy Cinsault, Syrah and Grenache with no signs of stress or disease. As the home of Classe, 7,Rue De La Pompe and 5SO this is especially welcome, as they are some of the big sellers. To Rome, my favourite vineyard. 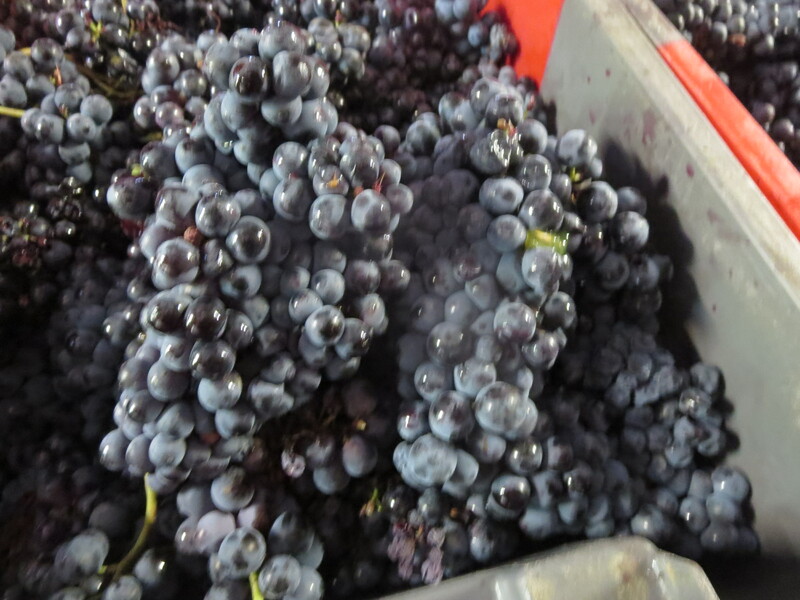 The gobelets were looking well, plenty of grapes both the white varieties and the Cinsault. There was a little mildew around the entrance but minimal, no cause for concern. Could there be a cuvée of Copains in 2015? Jeff tells me that no decisions are made as yet, caution prevails and he will wait to see what the harvest gives him before he makes final choices about how to use the grapes and the wines which result. 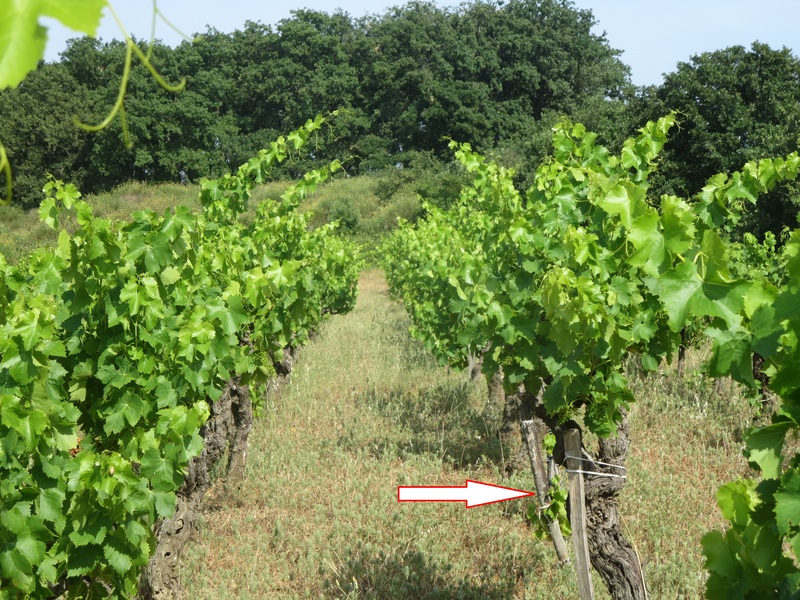 Sainte Suzanne (Metaierie) suffered from coulure in May with the strong winds blowing off some of the flowers on the vines, which will reduce yields a bit. 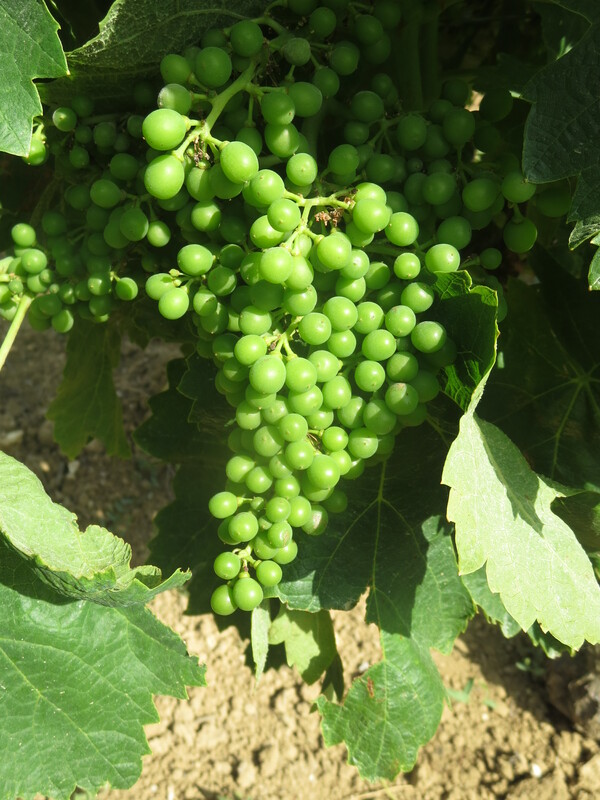 However, the grapes there are growing well, what might have been a problem looks now a much brighter picture, good news for fans of Vin Des Amis. 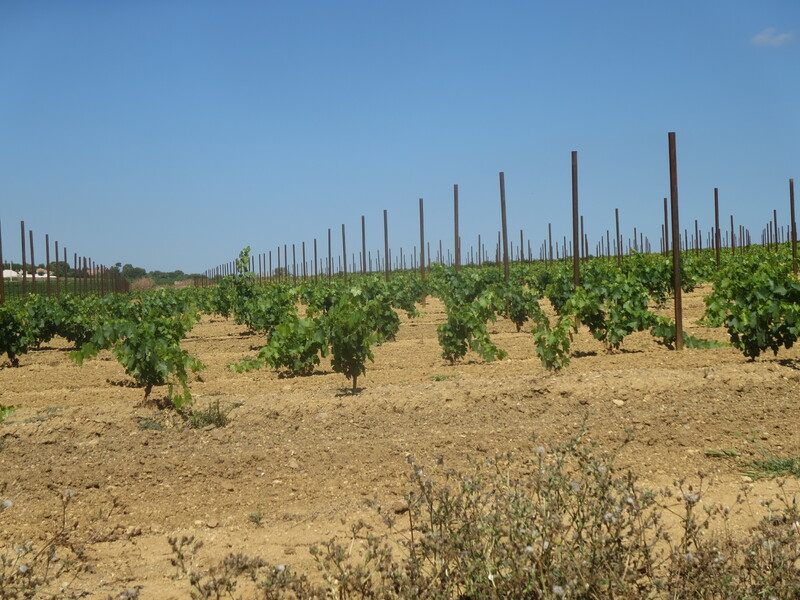 The only vineyard parcel which has shown stress is Peilhan, There was a lot of regrafting and replanting in the spring and the dryness has caused problems for these new vines. 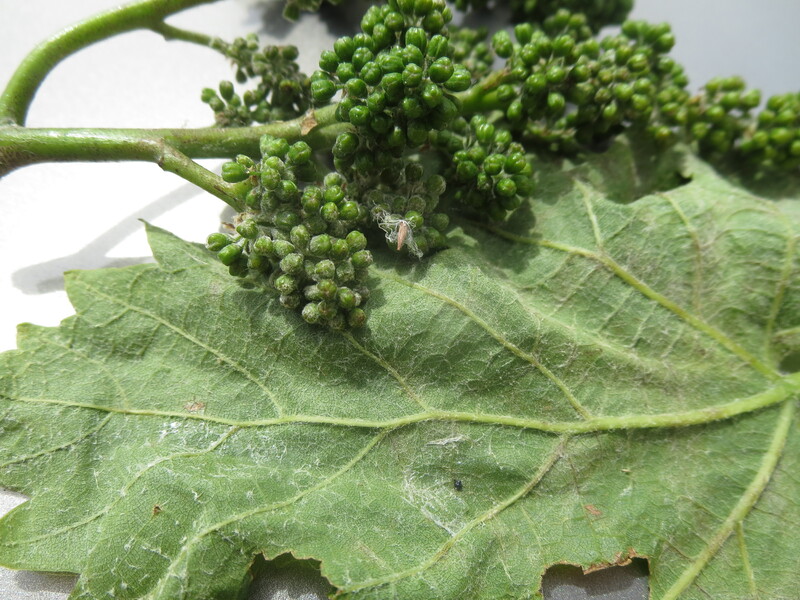 There was also oidium in this parcel, the only vineyard to be attacked by this powdery mildew. Yet amongst those problems there are plenty of healthy grapes, some careful picking and sorting will be needed but it will produce good wine. 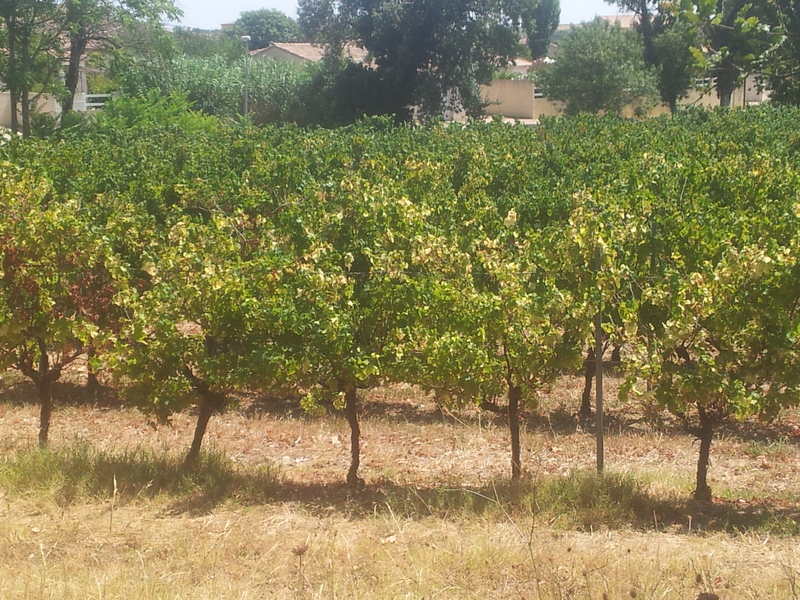 La Garrigue was blooming, the white varieties such as the Muscats are swollen and changing hue to lovely golden shades. 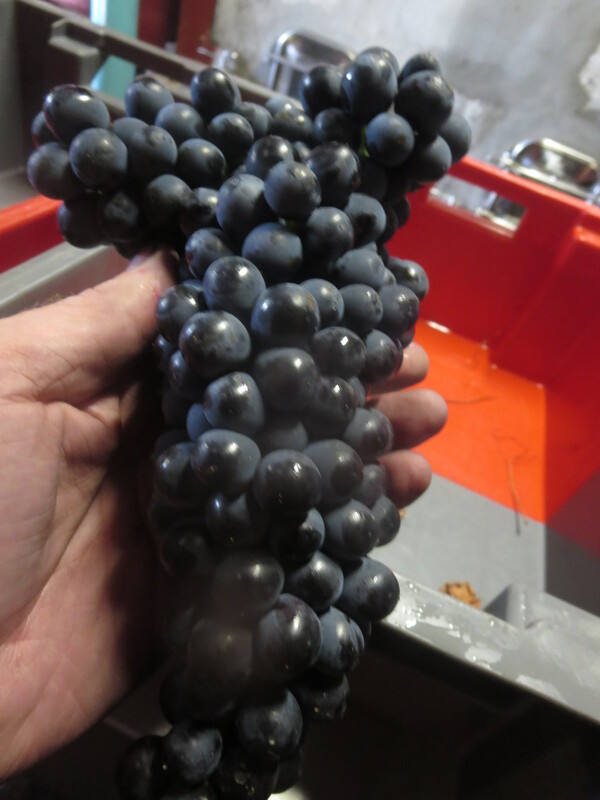 The Syrah is well advanced, a dark purple colour across virtually the whole bunches, the pips though betray a little immaturity as they taste and look green and sappy. A little more time and patience will pay dividends. As the world’s biggest fan of La Vigne Haute, I have my fingers crossed. 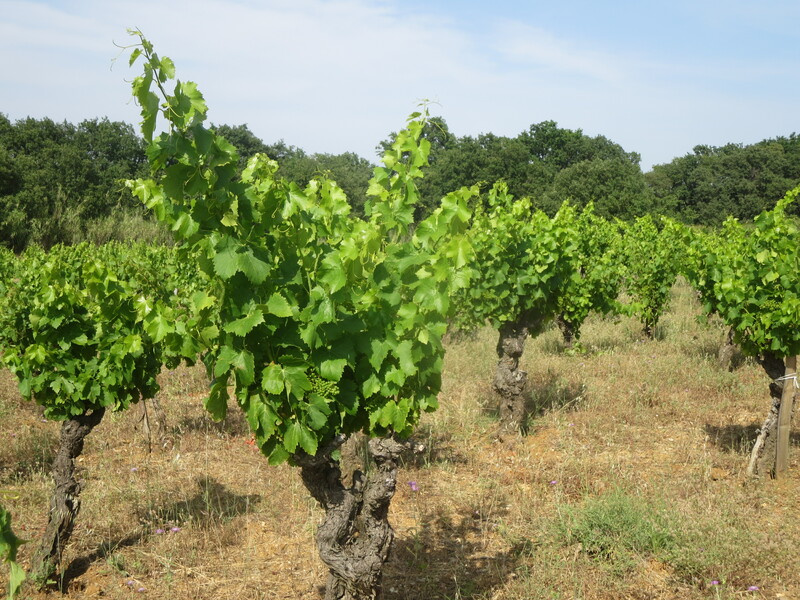 The Grenache in La Garrigue, despite facing south, is a little more delayed in colour but getting there and very healthy. In fact despite risks of disease earlier in the year (see here) Jeff has been able to use minimal treatments in 2015. Oidium and mildew (powdery and downy mildew) can be controlled by copper sulphate, sometimes called the Bordeaux mix when added to slaked lime. 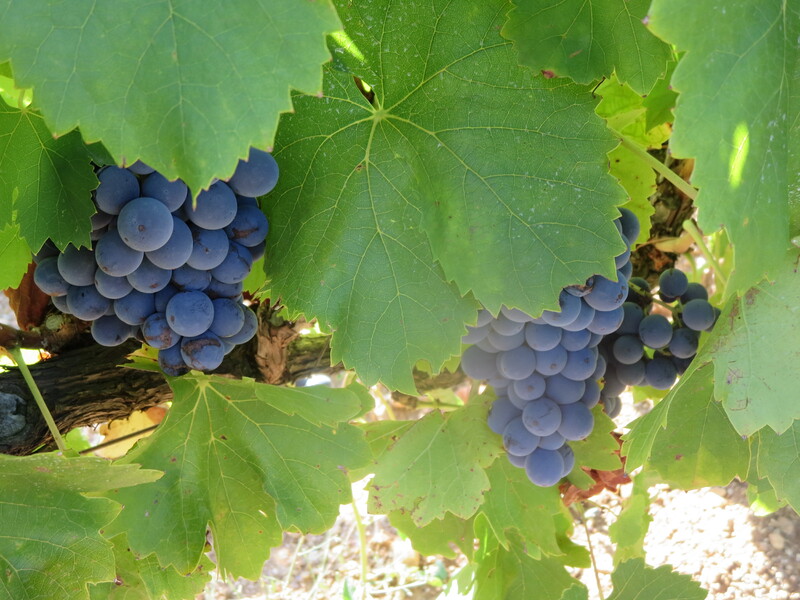 This is a bluish colour when sprayed by conventional and organic vignerons and is often seen on the leaves of vines. 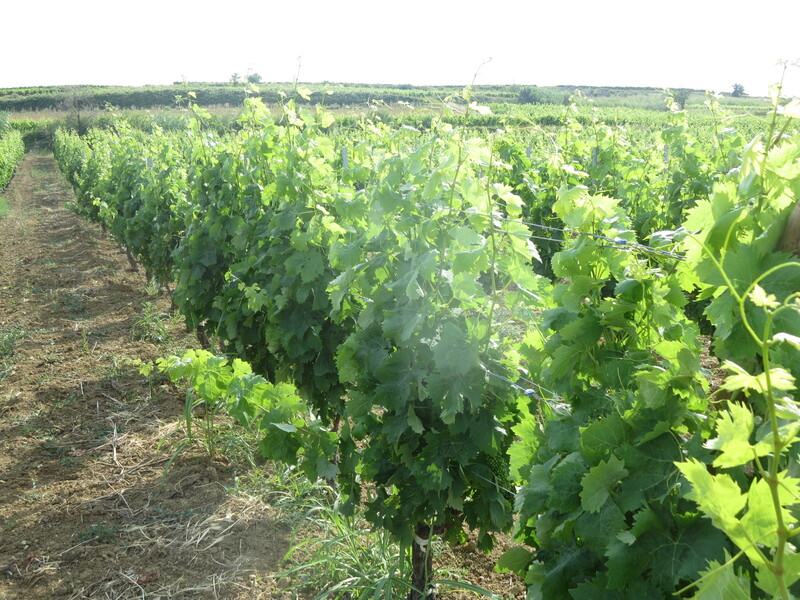 Vignerons might also use chemical fungicides if they are not organic producers. 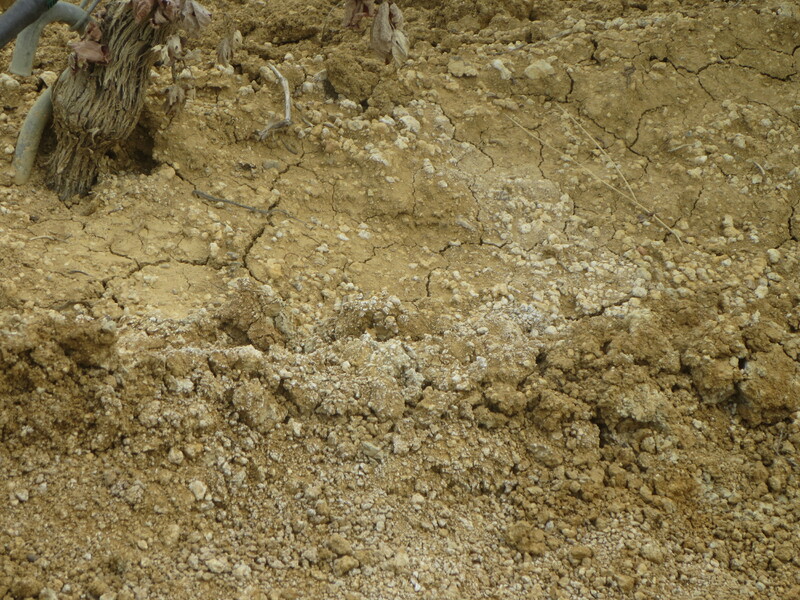 Some neighbours have also irrigated their vines and one alarming consequence is the changing of the soil and its pH as the calcium carbonate in the water shows through, you can see it in the white parts of the soil in this photo taken on July 22nd. The irrigation is also causing the vines to grow quickly and tall with thin trunks as seen below. 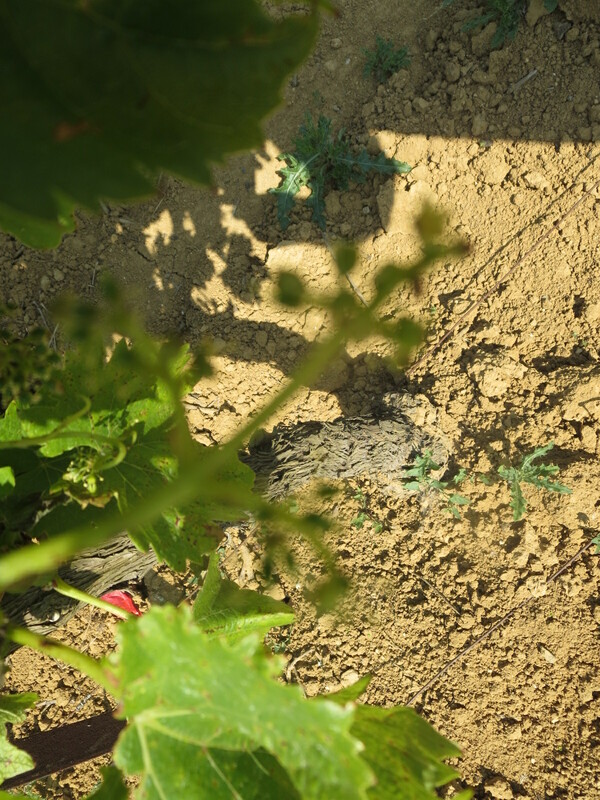 It should be acknowledged that there are many conventional producers who take great pride in the health of their soils and vines and would be horrified by some practices described here. As a proud holder of Ecocert organic status and as a natural wine maker Jeff must use natural products only. Tisanes of plants which fight mildew such as horse tail, fern and nettles can be sprayed and this is the basis of many biodynamic treatments. However, the two main weapons in the armoury of organic producers are copper and sulphate, both natural products. Copper is used against mildew, but is harmful to the soils and kills life in them if used in significant quantities. Organic producers are limited to 30kg per hectare over a 5 year period, allowing more to be used in years with more downy mildew for example but only if less is used in the other years. In fact Jeff has used just 200g per hectare in 2015 and this after years of well below average use, his use of copper is on a major downward trend. He is reluctant and very careful in using copper as he is aware of its danger to the soils, yet mildew has not been a major threat this year. Similarly Jeff has used sulphur in soluble form at doses much lower than the permitted level, three treatments over the course of the growing season. 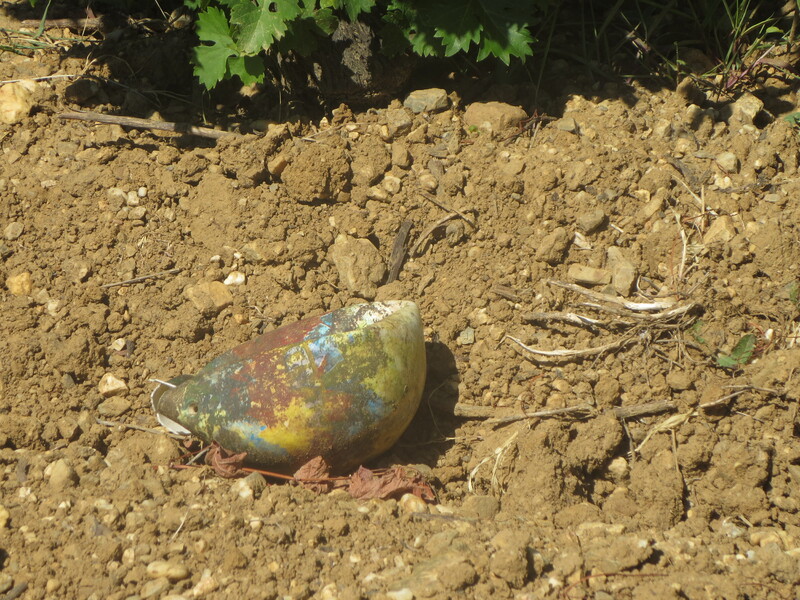 In addition one dose of sulphur powder was sprayed when the risk of oidium was high (May) and a second spraying for Peilhan only as it is the vineyard which was attacked by oidium. In contrast to neighbouring vignerons who have sprayed every 10 days including after the bunches closed up (so more than a dozen treatments) this really is minimal intervention. So July’s parting gift of 10mm of rain was welcome, August might like to follow by offering some rain soon. 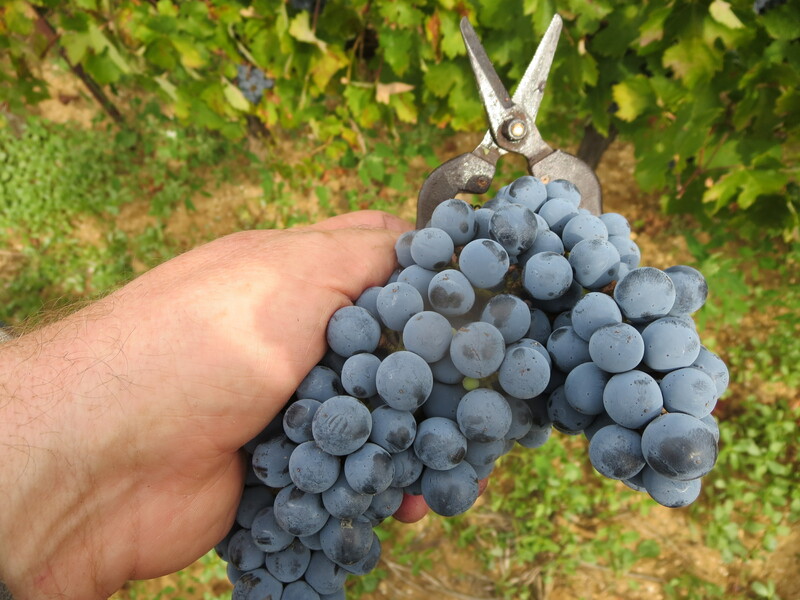 Too near the harvest is bad as it would dilute the juice rather than help the grapes to reach a good size. Things look promising, let us hope that nature completes its bounty. There is an old saying that June makes the wine and August makes the must, ie the character of the wine with its colour, yeast and flavour. With 3 weeks or so until picking begins it is an exciting, and nervous, time, waiting to see what that character will be. No Icare this time but look what we found amongst the vines, he’s been here! NB there are lots of reports about recent wine tastings here. Categories: Vignerons, Vines, Wines | Tags: 5SO, Castets, Cinsault, Classe, Copains, copper, coulure, downy mildew, Ecocert, Grenache, La Garrigue, La Vigne Haute, Mas Coutelou, Metaierie, mildew, Muscat, oidium, organic, Peilhan, powdery mildew, rainfall, Rome, Sainte Suzanne, Segrairals, sulphur, Syrah, Vin Des Amis | Permalink. May was a drying month. Lots of sunshine with temperatures comfortably in the high 20s almost every day. However, this year was also marked by high winds. The Tramontane / Mistral blew for over a week and was truly maddening. Other winds meant the vines spent almost three weeks blowin’ in them. With the rise in temperatures during the day and cool nights natural problems emerged. Oidium or powdery mildew showed itself first encouraged by the humidity resulting from daytime heat and cold nights. This was followed by mildiou or downy mildew and vignerons all around the region were talking about its appearance by mid May. 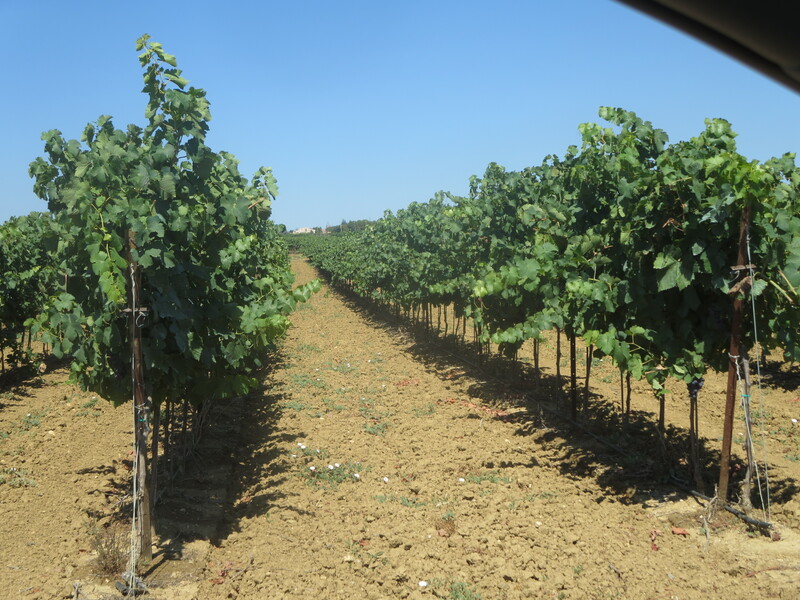 And in fact the high winds were helpful here, drying the vines and lessening the impact of mildew. 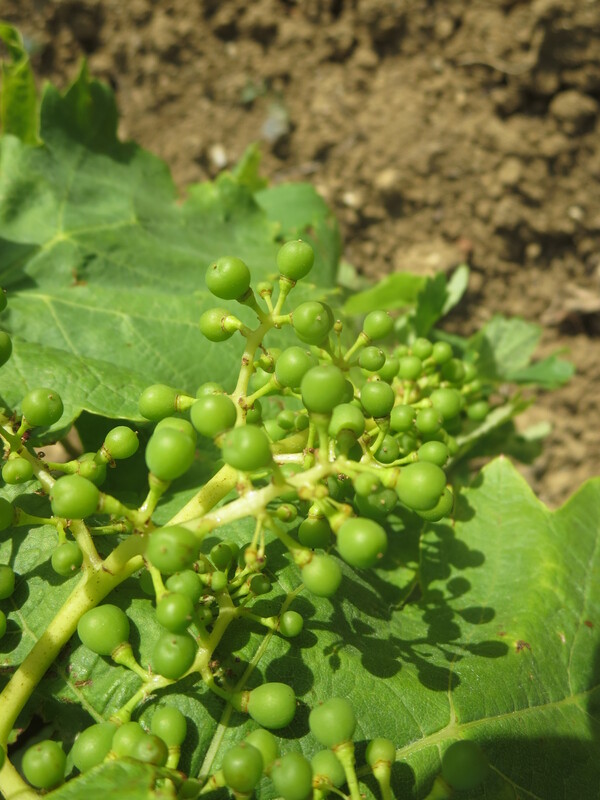 At this stage if the vigneron can get on top of the disease then it is not a huge problem unlike if it were to get amongst the grapes later in the season as this could influence the taste of the wine. Oidium can be treated by pesticides. Pesticides refers to any treatment which will get rid of problems, animal or fungal. 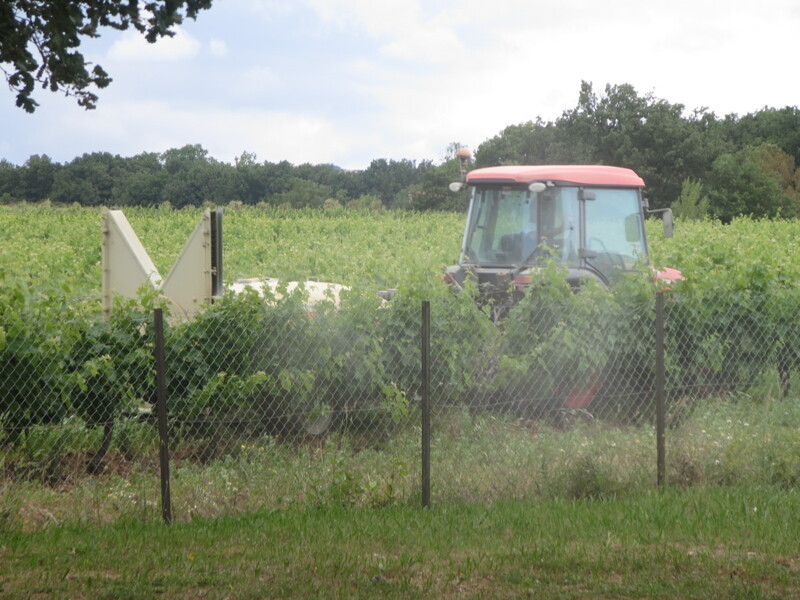 Conventional vignerons will use chemicals or synthetic products to spray onto the vines. Organic producers also use a chemical, sulphur (I shall use the UK spelling of sulfur). 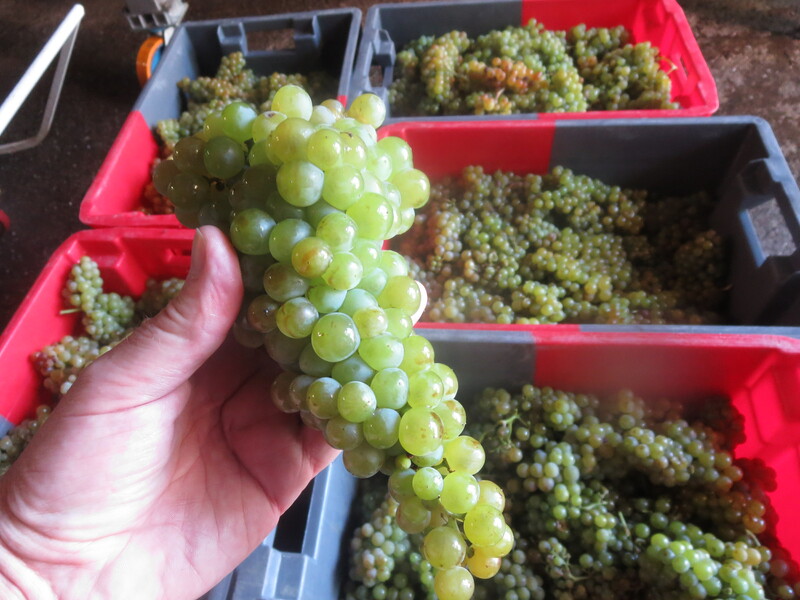 Many non organic producers point out that sulphur is chemical and does damage life in the vineyard such as yeasts. Organic producers would counter that sulphur has little lasting effect especially on the soils and that sulphur is natural. The amount used will vary depending on the year, in 2014 Jeff used less than a quarter of the amount he had to use in 2013 when there was more oidium around. Other organic / natural producers will no doubt have used more as Jeff uses the least possible. Indeed on Saturday morning he was spraying between 2 and 5 in the morning as he feels that during the night the vines are more relaxed and take the sulphur better, so needing less of it. Not all vignerons would be doing that! In addition he uses horsetail weed and nettles in a tisane to treat the vines so as to use less sulphur. This practice is common amongst organic and biodynamic producers. Conventional producers can use various chemicals instead. Organic producers would say that these are absorbed by the plant rather than just being in contact with it and so the vine becomes resistant and needs more of the treatment. Many conventional vignerons would deny this and say that synthetic chemicals are longer lasting and reduce quantities. Mildew is more complex. The traditonal treatment is copper, again a natural product but one which does leave its impact upon the soils and their ecosystem, for example killing worms and some mushrooms/fungae which support the soil. This inevitably draws criticism from conventional producers. Organic producers in one of the licensing bodies, Ecocert, are allowed to use up to 30kg per hectare over a 5 year period, averaging 6kg per year but amounts can vary annually according to the risk of mildew within the 5 year limit. Jeff used 2.9kg in 2013 but only 0.9kg in 2014 so well under the limits allowed. So as a wine buyer you have choices to make. As ever much depends on the producer. There are some who spray chemicals in large quantities, usually for cheaper, bulk wines. Select wines by the producer if you know them, knowing that their practices aim to support the health of their soils and their vines. However, May brought one final twist in its tail. Just as the winds helped relieve the problem of mildew they created a new problem. 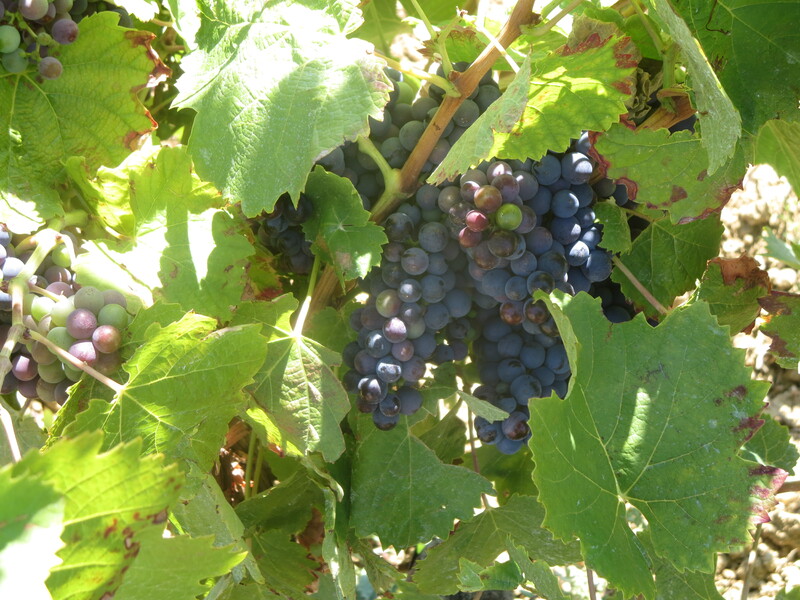 Jeff contacted me on Friday to say that coulure was showing in the Syrah vines of one vineyard. 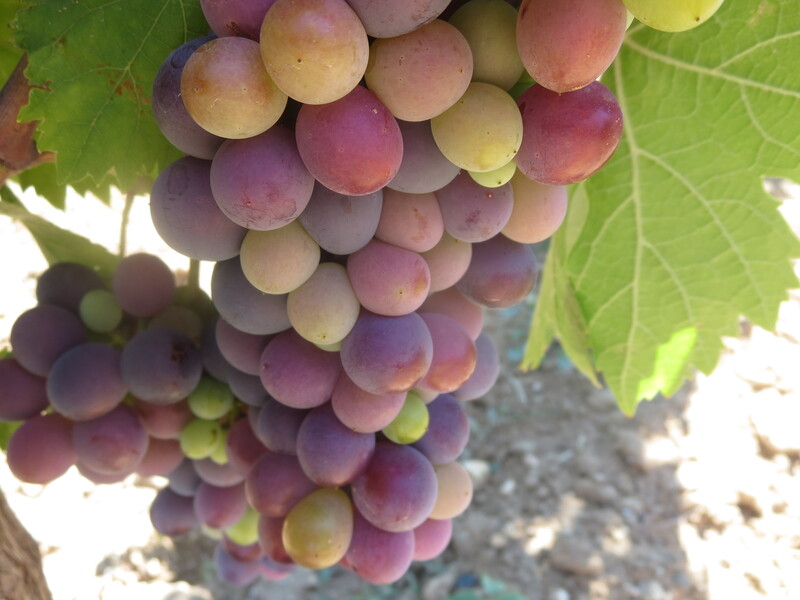 Coulure is the uneven development of grapes. 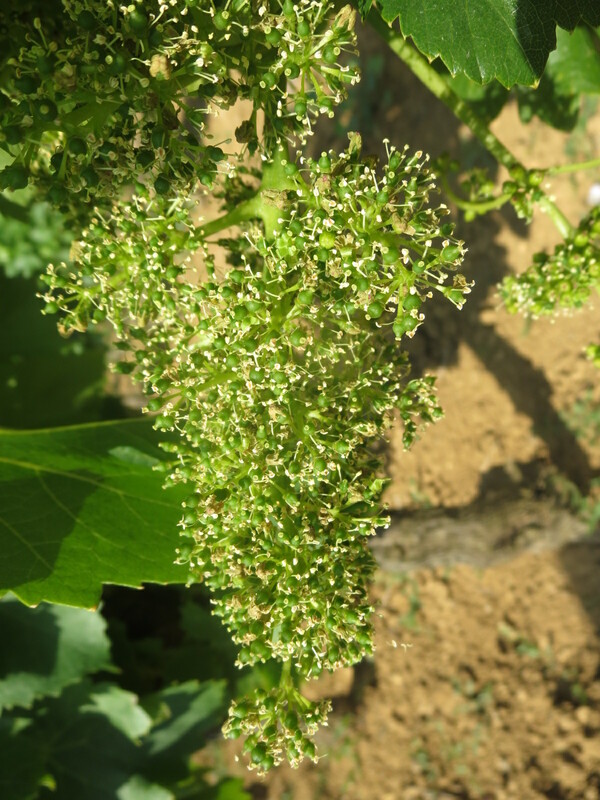 Flowering is a highly delicate time for the vigneron as they are very fragile. The wind damaged some of them and the Syrah vines especially. Without a flower the grape can’t develop. 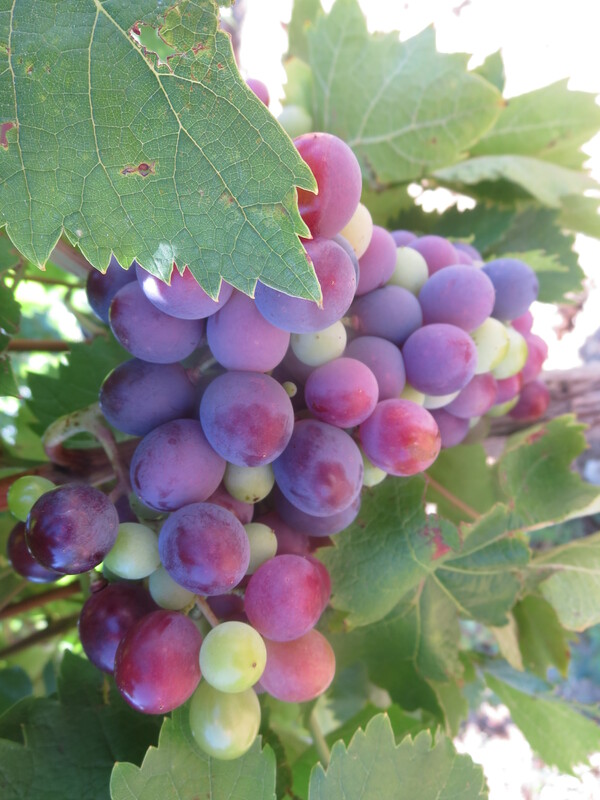 So the bunch will have some but not all grapes, leading to reduced yields. The remaining grapes will grow a little larger to compensate but not enough to make up the losses. Not good news, especially for lovers of Vin Des Amis like me. All the vigneron can do is wait and see how things develop, patience is required. As ever nature rules the day. At least one member of the team is laid back! 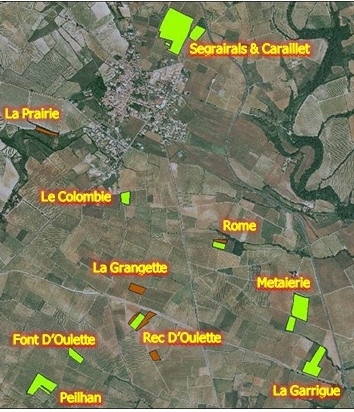 Categories: Vignerons, Vines | Tags: conventional, copper, coulure, mildiou, oidium, organic, sulphur | Permalink.